A Scottish housing association, Fife Housing, has had fitted door entry to 84 flats in and around the Fife area; tailor made to meet the entry requirements of residents. 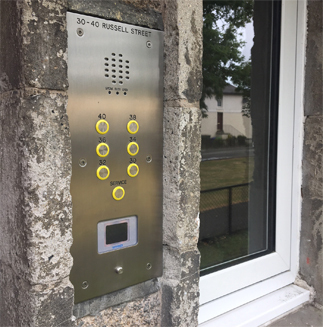 As installed by local firm Caledonia Fire and Security, the access control and door entry product company Videx has supplied audio intercoms to 14 blocks of flats. The panels have Videx’s standalone offline proximity system, MiAccess, as part of a multiple entrance system without the need to cable between devices. All block panels are also engraved with numbers and addresses, as part of the bespoke service offered by Videx. That enables call buttons to be named or labelled, helping the caller to speak to the right person when they visit or highlighting a concierge service/emergency number facility. Andrew Thomson, Director at Caledonia Fire and Security, added: “The access control system we installed into each of the 14 Fife Housing blocks are not only manufactured to a high quality but look the part too which is not always easy to find. The intercom systems, including the MiAccess integration, were absolutely perfect for this development and, from an installation point view, such a seamless process. No cables, no fuss, no downtime.